Mandala means “circle” in Sanskrit, and crocheters have been making them since way back . . . only we’ve been calling them doilies! The mandalas of today embrace bold colors, varying yarn weights, and a plethora of stitch patterns. Working these round motifs in a single color produces a chic, romantic look; using multiple colors makes for really fun boho combinations. Mandalas are popping up everywhere— but what do you do with a finished one? Catch good vibes and create fun hanging art. Creating a crochet dream catcher is easy—make a mandala and frame it within an embroidery hoop or other circular frame, then hang feathers or ribbons from the bottom. Thread has never looked so stylish. The Mehndi Crochet Necklace by Lori M. Carlson from Interweave Crochet Summer 2013 is a great example. 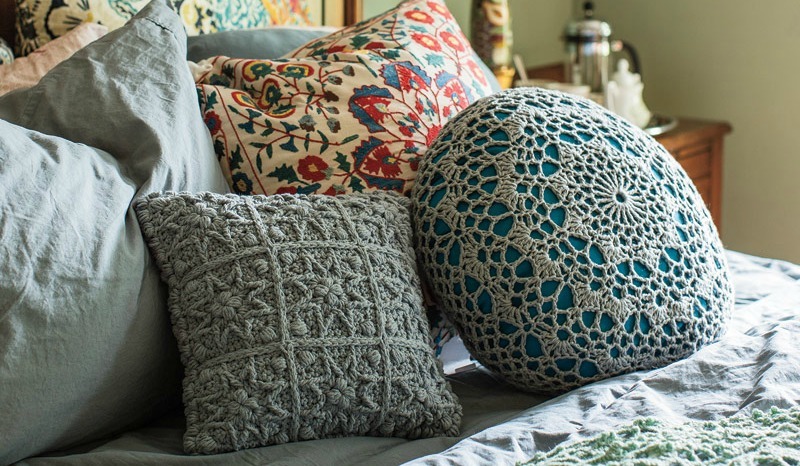 Elegant or exuberant, mandalas are great for round throw pillows. 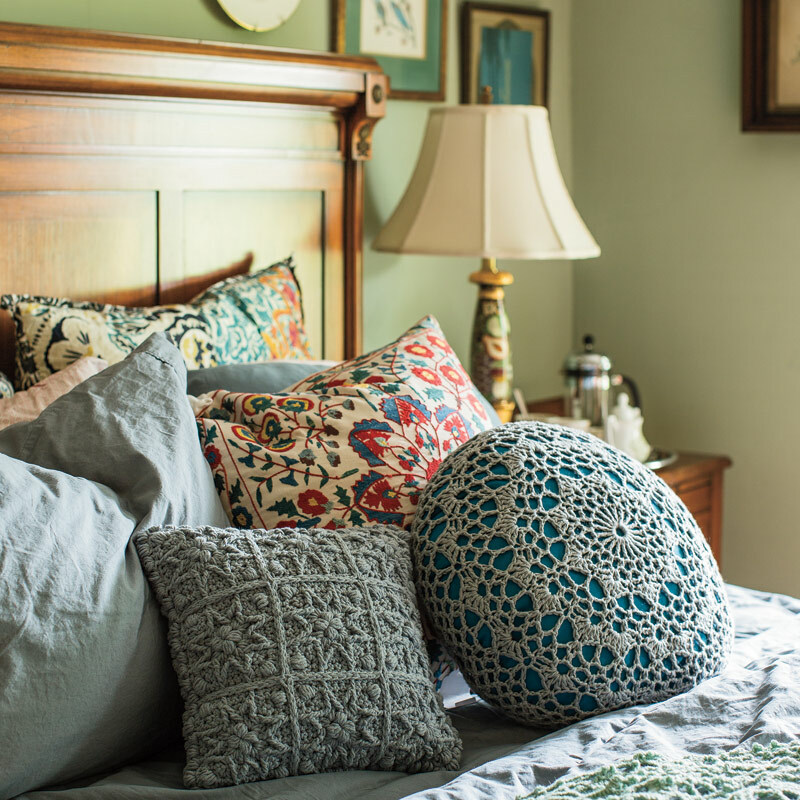 Try the lovely Doily Pillow by Doris Chain in Interweave Crochet Home. 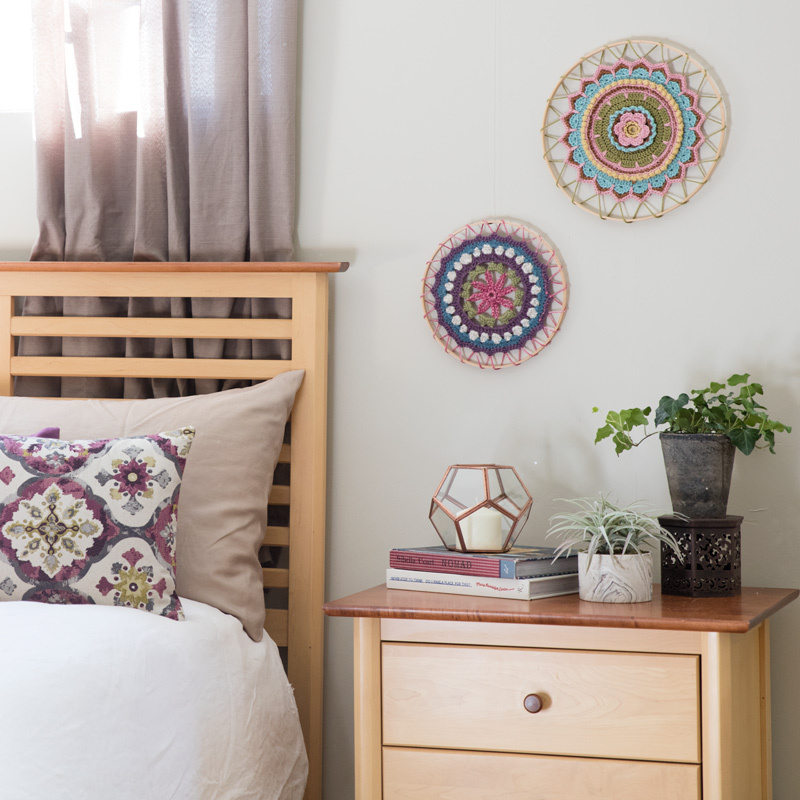 With or without an embroidery hoop, mandalas add pops of color to home décor. Deborah Bagley designed two beautiful mandala wall hangings in Love of Crochet Spring 2017: Desert Rose Mandala and Daisy Chain Mandala. Use cotton or wool yarn to make these round motifs safe for the kitchen or dining table. Several patterns in Modern Crochet Mandalas would work very nicely for hot pads. Stash-bust with your favorite colors to create a one-of-a-kind blanket. You can either join the motifs as you go or work a bunch, lay them out to determine your preferred arrangement, and then use single crochet or chain work with the main color to seam them together. The Moorish Afghan by Lisa Naskrent from Interweave Crochet Fall 2009 would be a great pattern to work through your stash. Add rounds until you have the size you desire. Be sure to add a nonslip rug pad underneath for safety. Start with the mandalas from Modern Crochet Mandalas then add rounds to your hearts content, or until you reach the size rug you need. 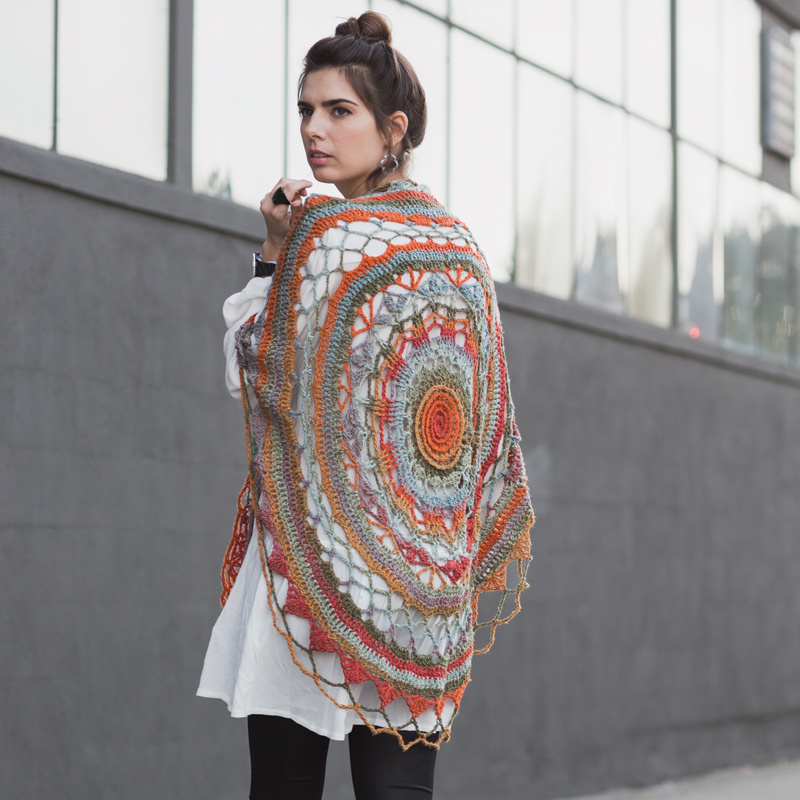 Work one huge mandala to create the perfect focal point for a circular shawl! The Ventura Shawl by Zsuzsanna Makai in Interweave Crochet Summer 2016 has a large mandala design center and two wings for wrapping and wearing bandana style. 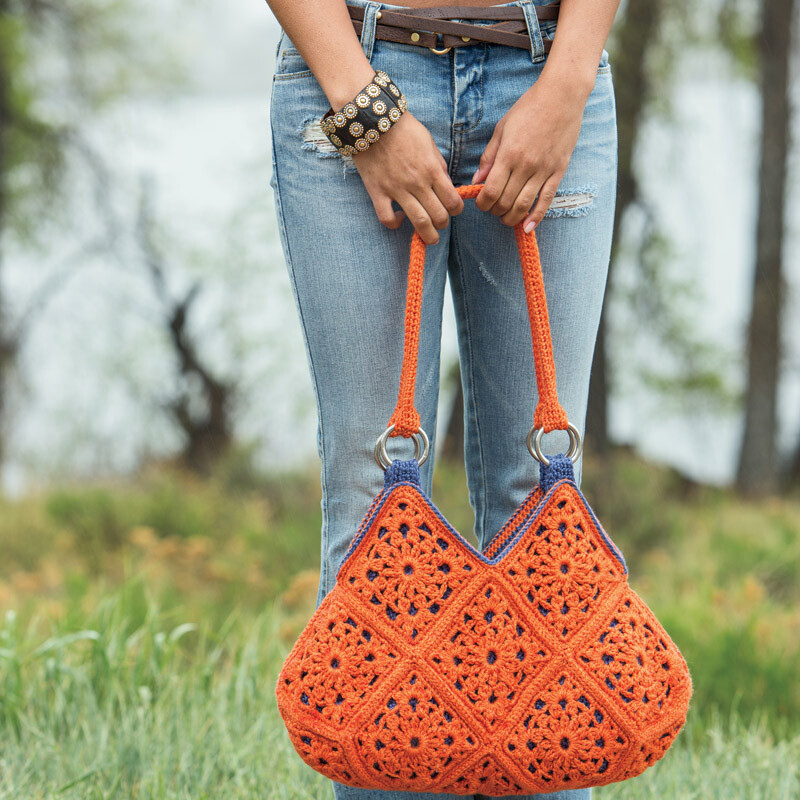 Create a bag with one giant mandala or several mini-motifs. The Delia Bag by Brenda K.B. Anderson from Crochetscene 2014 would look playful crocheted in multiple colors. 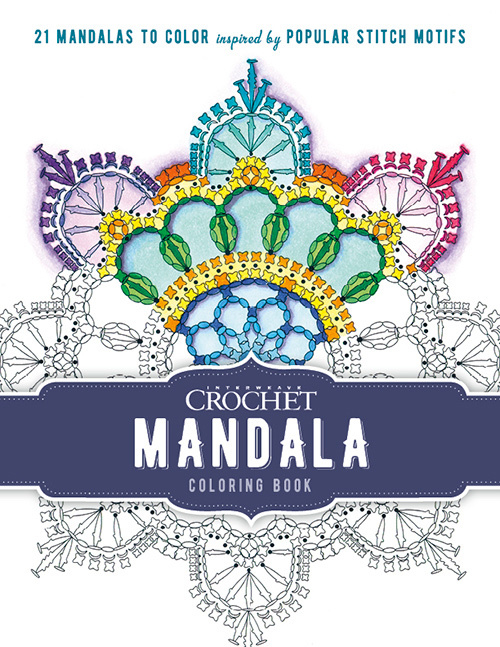 Break out your markers and colored pencils to color the mandala motifs in the Interweave Crochet Mandala Coloring Book. 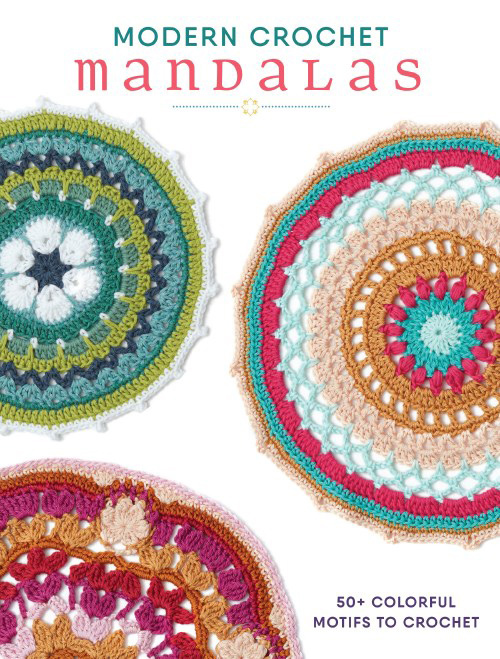 For those with mandala mania, you’ll want to check out the Spring 2017 issue of Love of Crochet magazine. You’ll find six beautiful patterns that incorporate mandala motifs. There’s a tutorial on how to read charts for projects worked in the round. The fun finds column has fun products that mandala makers will love. There’s a book excerpt from Modern Crochet Mandalas for your to enjoy. When you are ready to crochet something other than mandalas, the Spring 2017 issue also has toys, tops and shawl patterns, too! Start your mandala project today!